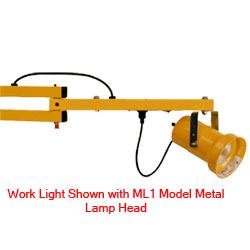 Double strut work lights are ideal for focusing light into poorly lit truck trailers where product is being loaded or unloaded with pallet trucks or fork lifts to help increase worker safety and minimize product damage. The LED light module boasts a 5 year warranty, uses 80% less energy than standard incandescent or halogen bulbs and instantly achieves its maximum light intensity without a warm-up period. A polycarbonate lamp head helps protect the LED module from impact damage, focuses the lighting in the desired direction and stays cool to the touch making it ideal for refrigerated and food service applications. To shine the light in the desired direction the 40" double strut arm has two adjustment points, (one at the base and one in the center) that rotate the lamp head around work place obstacles.